It was the end of 1969 and Paul Rodgers was a long way from home. While chart success still eluded the Free vocalist and his band at this point, their reputation on the UK blues circuit had been enough to earn a string of dates on the American West Coast supporting Blind Faith. One particular afternoon the band had pitched up at a sun-dappled hippie commune outside San Francisco where Rodgers, still in his teens and more familiar with the industrial smog of his native Middlesbrough, felt the muse strike. While all around him tripped on hallucinogens, Rodgers sketched out the song with a clear head. Rodgers has never revealed the subject of the song’s lyric – “It’s been a long time and I don’t want to get into trouble” – but admits he wanted an everyman feel that was open to interpretation. “I think that opening line is interesting in its simplicity,” he says. “‘Baby, when I think about you, I think about love’ says a lot in a few words, and that’s what I always aim for. It’s easy to write a song, but it’s hard to write something that’s poignant; that makes the point quickly and means a lot to a lot of people. I’ve always written tender lyrics as well as tough rock songs,” he points out. Free never recorded Feel Like Makin’ Love. 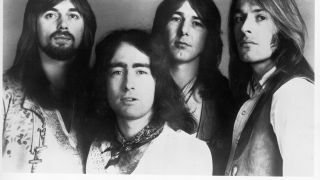 The band’s slow falling apart reached a head in July 1973, at which point Rodgers, having turned down the chance to front Deep Purple, formed Bad Company with Free drummer Simon Kirke, poaching guitarist Mick Ralphs from Mott The Hoople and bringing in ex-King Crimson bassist Boz Burrell in November. The band were taken under the wing of Led Zeppelin manager Peter Grant, and their self-titled debut album hit No.3 in the UK and No.1 in the US in the summer of 1974. Meanwhile, the song of which Rodgers had been so proud waited in the wings. It wasn’t until September 1974, and the recording of Bad Company’s second album, Straight Shooter, on Ronnie Lane’s mobile studio at Clearwell Castle in Gloucestershire, that Rodgers put Feel Like Makin’ Love forward for consideration. The approach worked, and the band nailed the song’s production at a similar pace. The Straight Shooter album campaign kicked off in April 1975 with the release of Good Lovin’ Gone Bad, but there’s little doubt that it was Feel Like Makin’ Love, released months later, that helped the album to sell three million. Rodgers’s intuition had been accurate; the song spoke to enough people to help it reach No.10 in the US and No.20 in the UK, and win a Grammy award.